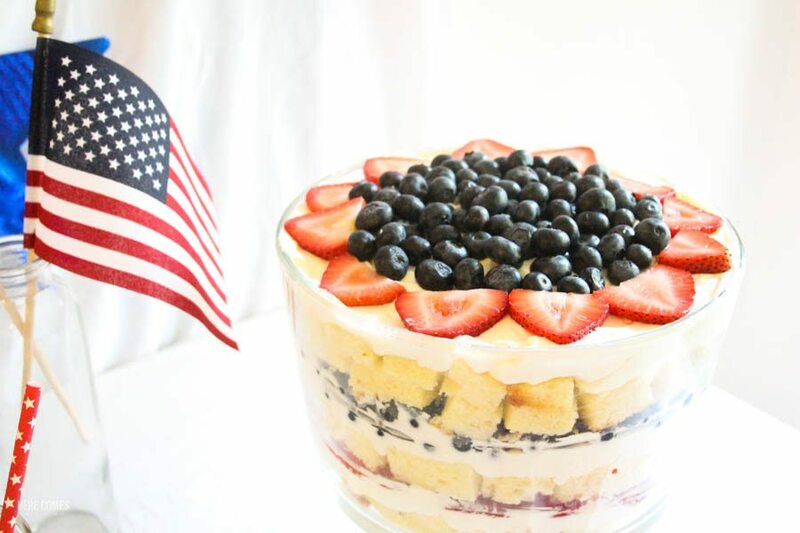 This no-bake strawberry blueberry trifle is easy and delicious. No-bake. That’s my jam. Anything to avoid cranking up the oven on a hot summer day. 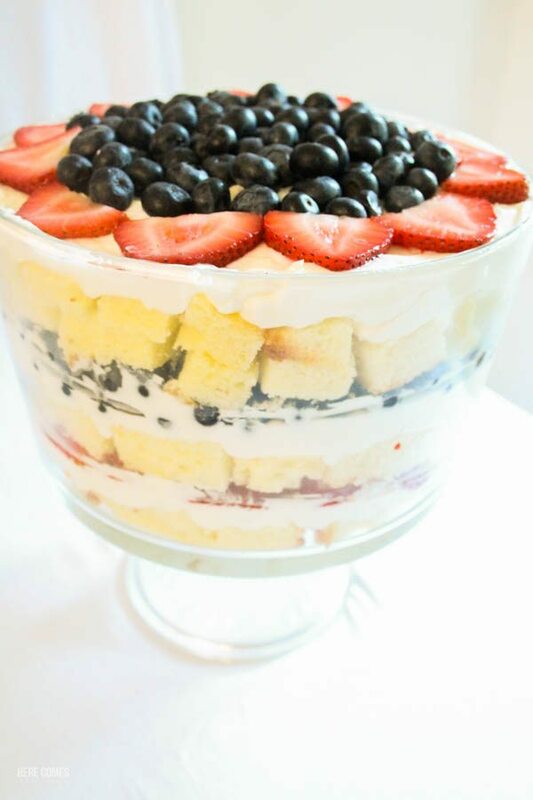 This strawberry blueberry trifle fits nicely into this category. This is the perfect dessert to make for your holiday celebrations of for all summer long. 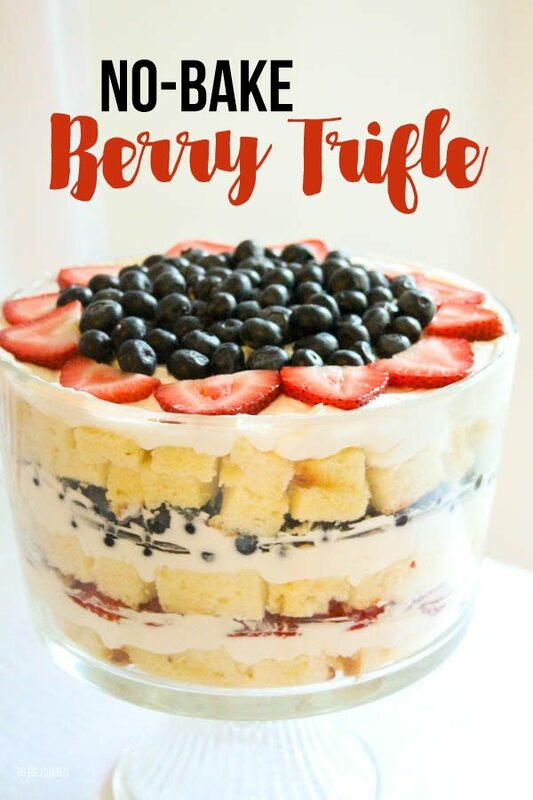 This strawberry blueberry trifle recipe comes together so quickly that it takes longer to eat it than it does to make it. *Almost*. The best type of berries for this recipe are fresh local berries but unfortunately the strawberries at the U-pick berry farm near us had just gone out of season so we headed to Costco for the berries. Is my house the only place where fruit disappears within a matter of minutes? I swear I can’t keep any fruit in the fridge for more than a day without my vultures sucking down every last bite. As I’m writing this, my son is sucking down his second bowl-full of grapes in the past 2 hours. My wallet just can’t keep up (sigh). And how crazy is it that strawberries are out of season by early June? I don’t think I’ll ever get over the fact that our U-pick farm opens in early March and is closed by July 4th. It’s just THAT hot here. I miss berry picking all summer long. We were lucky enough to get to the farm the last the day before it closed for one more outing and I will be hoarding strawberry recipes until next year when I can get my hands on the fresh berries. Because nothing beats a freshly picked, right from the farm, juice running down your chin berry. Store bought and refrigerated just isn’t the same unfortunately. Luckily, this farm does sell some of its berries to our local grocery store but they always taste better right from the farm. Combine 1/4 cup water, 2 TBS sugar and 2 TBS lemon juice. In order for this recipe to be no-bake, you need to buy premade pound cake. I found mine at Costco in a 3 pack and I used 2 of the cakes for this recipe. Have you ever seen something so gorgeous? I have not. Get creative with your berries on top! My design reminds me of a flower but it would look great with a blueberry star of even an American flag design. 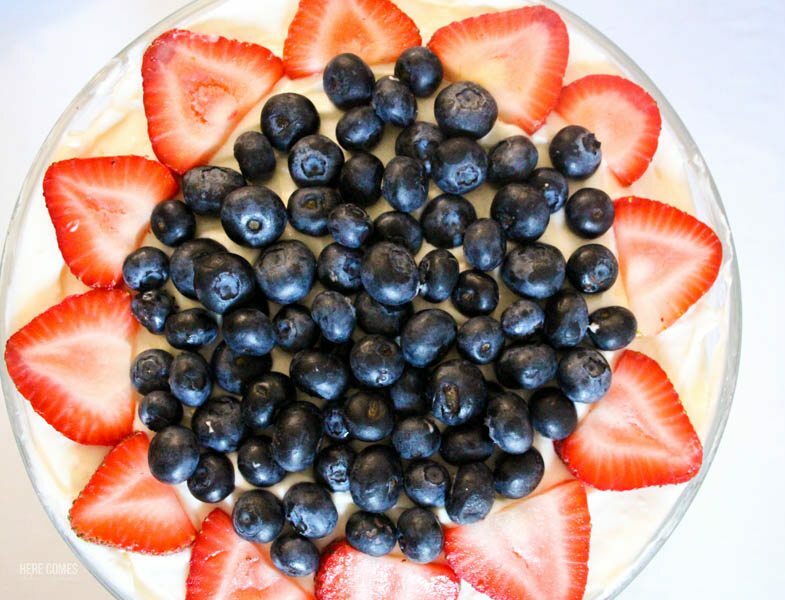 I served this with my July 4th party but it is also perfect for a weeknight dessert. Make sure to refrigerate this if you are not serving it right away. It is best eaten within a day or two of making it but I assure you that won’t be a problem because it’s so delicious. MAKE SURE TO PIN THIS SO YOU DON’T FORGET THE RECIPE! For more July 4th ideas, be sure to check out my July 4th party ideas, party garland, and printable sparkler holders!